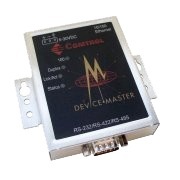 Comtrol DeviceMaster RTS-1 port is a single-port device server designed to enable serial devices to be placed on Ethernet especially in application where connecting serial legacy devices to Ethernet network without software changes is a requirement. The VDC version is designed specifically for use where an existing power source from 5-30 VDC will be used. ESD Surge Protection Provides minimum of 15KV protection for all serial lines. All Ethernet components are rated to 1.5KV magnetic surge protection.